A classic boating instrument! Robust and easy to use. 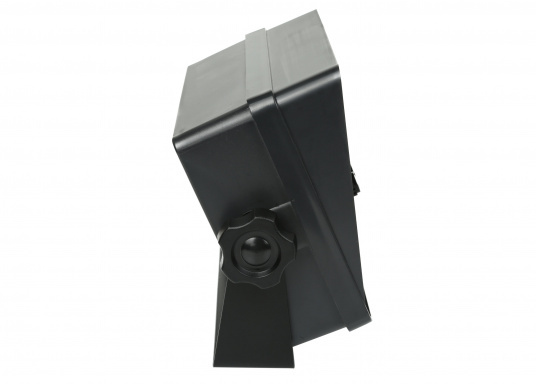 This sounder has 2 selectable depth ranges up to a max. of 120 m. Alarm can be activated. Also available as a twin version with an additional display. €119.95 Incl. tax, excl. shipping. 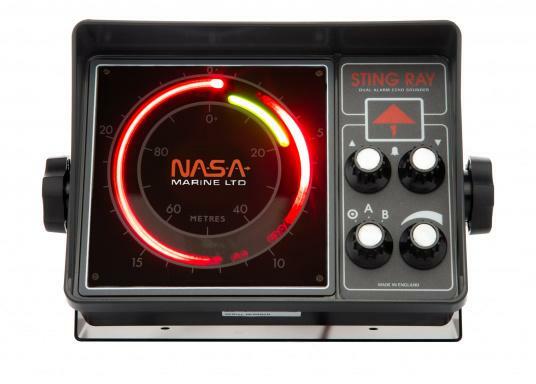 A classic NASA boat instrument. The device has a rotating light pointer. It is robust and easy to use. With the gain (amplification) controller, the display can be quickly and safely adapted to ground conditions. 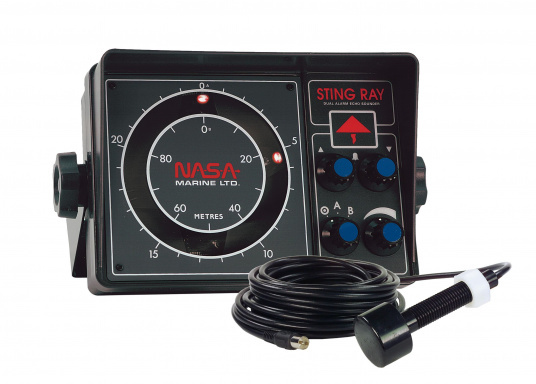 The NASA Stingray sounder has 2 selectable depth ranges up to max. of 120 m with a connectible continuous alarm. 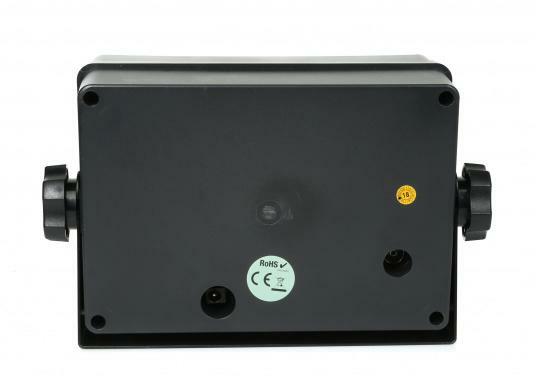 The power supply is 12 V. A 150 kHz transducer and an installation bracket come included. 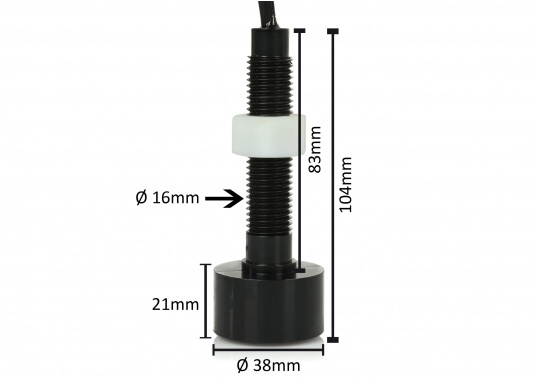 A sensor with a 7 m coaxial cable, including a connector is also included with this unit. Current consumption is typically rated at 130mA. Dimensions of the bracket: 200 x 130 x 90 mm. Also available as a twin version with an additional LCD display (no decimals displayed). First, you must provide voltage to the display device and connect it to the transmitter. 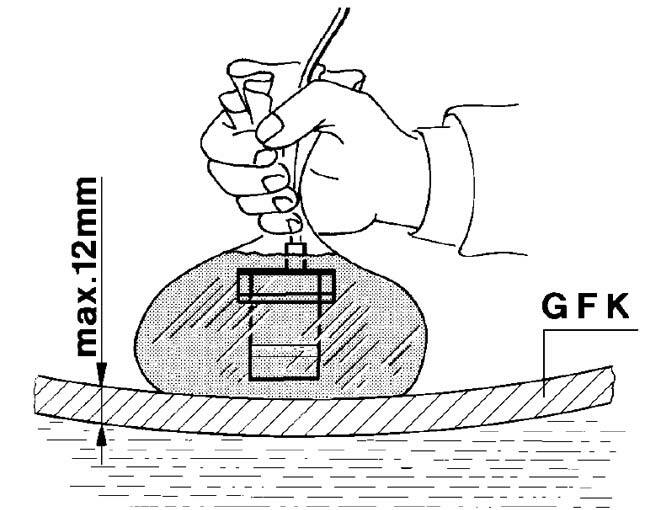 Next, you must hold the transmitter in a water-filled plastic bag until a stable depth reading is achieved. Now, the final tuning of this device can be performed. However, if no stable depth reading can be successfully achieved, you should choose a breakthrough assembly instead. Ce sondeur fonctionne parfaitement selon mes attentes et semble particulièrement efficace bien que ma sonde soit installée sans perçage de la coque. Je visualise sans aucun problème et très nettement des profondeurs supérieures à 50 m.
Je suis totalement satisfait de mon choix. Ich kenne das Produkt schon, war immer sehr zufrieden damit. Darum habe ich es mir jetzt wieder gekauft! Gerät funktioniert einwandfrei. Ich bin sehr zufrieden. Ale einfaches Hilfsmittel zur Tiefenmessung gut geeignet. Liefert brauchbare Werte, einfach in der Bedienung. Wird auf älterem Motorboot eingesetzt. ausgesprochen sehr gute tel. Beratung, bester e-mail-Kontakt. Ware wurde auch schnell verschickt. Die beste Möglichkeit einen bereits früher installierten Seafarer-Geber weiter zu verwenden. Mit dem Produkt rundum zufrieden.